And so my 2nd European vacation begins as I step off the airplane at London Heathrow’s busy airport. I wait in line anxiously for border control rehearsing what I would stay and when it was my turn I fumbled my way through “what is the purpose of your visit”? What was the purpose of my visit? Visit friends, romance, visit schools, work, site seeing? I suppose all of those things are true, but how much weight do I give to any one thing to determine what the sole purpose of my trip was. After showing extra documentation and explaining how I would pay for school if accepted, I was let through the border patrol lines. I stumbled clumsily with my bags out of the airport and into the express train towards center city London where I would be staying. The train system was not only easy to use, but clean, had streaming news media and free WIFI. By the time I managed to log on and update my Face Book status, the train had come to a halt at the Paddington Tube station. After a little deliberation and consulting the station workers, I purchased my rail pass. It was $3 more than what I calculated on-line – already missing my budget! I planned meticulously for this trip; laboring for hours on a budget, what sites I would see, and how I would get around. While I was obsessed with it, I find having a plan makes being in a foreign place so much easier. It’s fairly obvious from the time I open my mouth that I am American, but I have so far avoided the “lost traveler” look. You know the one – where the traveler is standing in the way of everything with a map – looking left and then right like a deer caught in headlights. I avoided that to a certain extent, but my inner Bridgett Jones surfaced. Usually poised, confident, and in control, I found myself dropping my luggage, running into people, and becoming a clumsy version of myself. I was lost in a sea of people. My trip to the hotel reminded me of being in New York; everyone was a mission. I had to keep up or nearly get trampled on. It seemed a good amount of people were annoyed at people dragging their bags and taking up space in the walkway. I also felt a tad of confusion with regards to what side of the street to walk on. We drive on the right. Naturally, we are conditioned to walk on the right side of the sidewalk. Since the Brits drive on the left, I thought it was natural to walk on the left. I still haven’t figured that part out, but it seems no matter what side of the walk I found myself on, people were unrelenting about yielding to passerby’s. 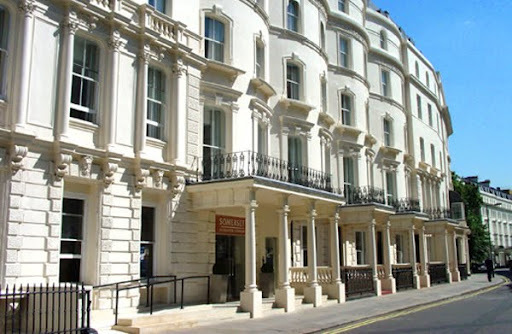 I made it to my hotel with no problems; it was short walk from the Bayswater tube station. The hotel was nestled in an interesting neighborhood – residential, yet packed with small, boutique hotels. Even the Best Western looks like a bed and breakfast. The hotels are very unassuming and fairly unnoticeable unless you are looking for them. I walked right past it. My room was unavailable upon arrival and so I decided to find some British gastronomy. I finally settled on Café Mooca that had an advertisement outside of the door promoting a full British breakfast for 4.95. After a few minutes, I’m greeted with a full British Breakfast: tea of course, sunny side up eggs, bacon, sausage, pork and beans, a million mushrooms, toast, and a small plum tomato. It was not a combination of food that I would have thought to put together or one that I have eaten in the past. I hardly ever eat mushrooms, but as the saying goes, “when in rome…” (You know the rest). I settled in my room and slept off some of the jet lag and ventured out again for dinner. As I walked up and down the street, I fell in love with this neighborhood. It reminded me of Park Slope Brooklyn. It was very diverse and had a heavy Middle Eastern and Asian influence. While I normally don’t mind doing things a lone, I couldn’t help but wish I had someone to walk the streets with and debate over a restaurant of choice. The weather was, as I heard on the news, unseasonably warm, and the skies were clear. After much debate, I opted for a burger joint; the Gourmet Burger Kitchen. For the foodies, it was an opportunity to get burgers with interesting toppings and add-ons such as eggs. I opted for the most plane burger I could find without mayo or relish and a Becks beer. Don’t ask me why I ordered a German Beer or a beer that I hardly ever drink, but I felt compelled to order a beer with my burger and fries! After my burger and fries, I went to bed!